Thank you for your generous contributions to Operation Christmas Child. 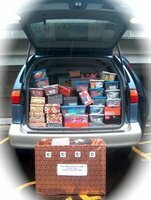 Today 59 hope-filled shoeboxes were delivered to the area drop-off center located at Rolling Hills Community Church. Please pray for the children who will receive these gifts, and for their families, that the Lord will prepare their hearts for the Gospel message that will be included with each shoebox. Four more shoeboxes arrived on Sunday afternoon, for a grand total of 63 shoeboxes. A special thank you to Clackamas Nordstrom Rack for donating 20 ready-to-fill shoeboxes. I wonder how many we could do if every family did just one!? Pretty cool getting boxes from Nordstrom Rack, sometimes it is hard to find a shoebox that works! Judy, thanks to you and your helpers for delivering them.